The Sept 12 opening at the Museum Of Contemporary Art in Detroit was great fun. I was very happy so many people came to see my show at MOCAD. It was a lot of work to plan and make the boxes and then fill them with copies of articles and photos and things that were important in my life. Left wall of my exhibit at MOCAD People's Biennial 2014. Puzzle table with Camp T box, in the corner puzzle table with 500 mile Ski Expedition to Lapland, center wall has puzzle table with 2 sections that extend out with a center area for moments and a drawer below full of photos. Above this box is a rustic walnut Mantle shelf that holds two turned pieces and the walnut triangular shaped box I designed and built for my father's internment flag. The walls have frames built with oak in a similar interlocking design as the puzzle tables. Far left are 2 shelves. The top one holds Bottle stoppers I turned and the lower shelf has some jewelry boxes i made. My mother saved everything so I had things like report cards and letters I wrote to her from my time at the Michigan School for the Blind in Lansing. I attended school there from 2nd grade to 11th grade. I wrote home saying I wanted to go outdoors and play. (I still do) I learned to cross country ski at MSB and it became a passion I pursued for many years. I built a Hickory box that was made to fit an iPad into the top with a slideshow of the 500+ mile skiing expedition I took with several friends across Lapland in 1982 . Hickory box with slide show showing a reindeer herd we encountered on a 500 mile trip across Lapland. It is setting on a bungalow style puzzle table I designed and built. Hickory box with slide distinctive dark grain pattern. Side view of the Hickory box in open position. The iPad in the lid plays a slide show of my trip across Lapland and then a slide show of a trailer for "Maire's Journey" a documentary made by Keith Famie about Maire Kent's losing battle with Cardiac Sarcoma and then follows a boat I built for her ashes as it made it's journey from launch at Cross Village, Lake Michigan all the way to the Atlantic Ocean where her ashes were released. My father died when I was young. He served in WWll and I designed this walnut box to hold his Military Flag. The rustic walnut shelf is made from a tree that had grown too large for the space between a house and garage in Minneapolis. Side view of the Walnut mantle style shelf. Notice the side brackets still have bark on them. The piece on the right of the Flag Case is turned of oak with a lot of character. The giant Cherry wood egg on stand won second place at the Minneapolis turner's meeting at Easter time. The tall red box I call "Self Portrait" holds a worn out pair of my bib overalls, a flannel shirt and a summer straw hat I wore to pieces along with a cane I have traveled hundreds of mile with. On the left door are letter I wrote to my parents when I was in second grade, attending the MIchigan School for the Blind. On the right door are photos of three of my students I taught with their projects along with a letter from a mother thanking me for helping her daughter. The oak bookcase hold a 3 piece dome top turned jewelry box and a curly maple box on the second shelf. Close up of a jewelry box with a spalted birch top with ebony finial and a myrtle base. Three tiered oak box in closed position. 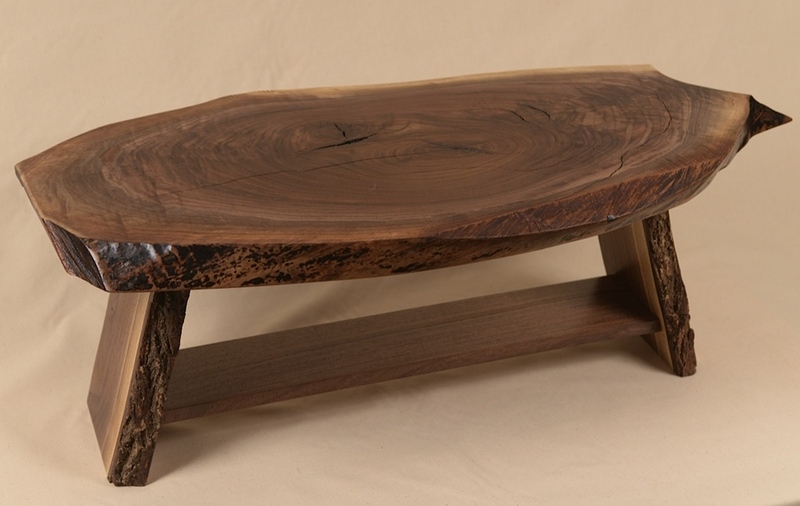 The walnut arms rotate to extend the top layer to the sides. Three tiered oak box open. The walnut arms rotate to extend the top layer to the sides. George Wurtzel on the right side of his exhibit at MOCAD. In the corner on a round glass top table he built is a miniature walnut grand piano representing his 10 years attending the Michigan School for the Blind in Lansing, A small version of one George was commissioned to build as presentation gift for Stevie Wonder- a fellow alumni of the school. The next table holds a puzzle like the one his grandfather made. This puzzle was the design inspiration for all of the glass top tables in this museum display. Closed view of the rough cedar box of Camp Tuhsmeheta memories. Camp Tuhsmeheta hold a very special place in George's heart. This box has snapshots of camp scenes on the inside of the lid, inside there are lots of newsletters and articles about Camp T while George was executive director of the organization who ran camp for many years. Top cedar shelf showing bottle stoppers George turns. Next shelf on right holds square cherry box with key joints on the corners and maple lid, next is turned walnut box with curly maple lid, and next is oak with box joint corners. Lower shelf holds a flamed maple box with walnut top and corners, ash box with box corners, distinctive square pedestal feet and hinged lid. next is mahogany box with lift off lid. 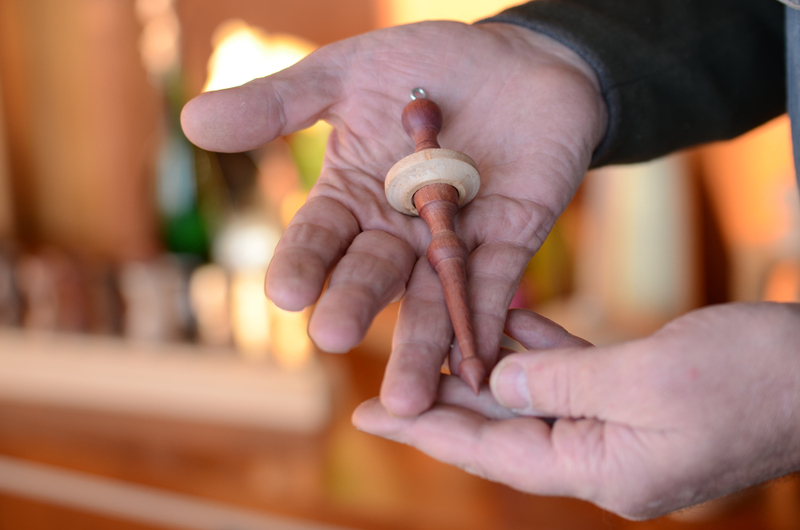 5 turned bottle stoppers made by George Wurtzel at his shop in Minneapolis. Close view of a spalted maple bottle stopper turned in the shape of a hat. Camp T Birdhouse and photo of the campers who built it. 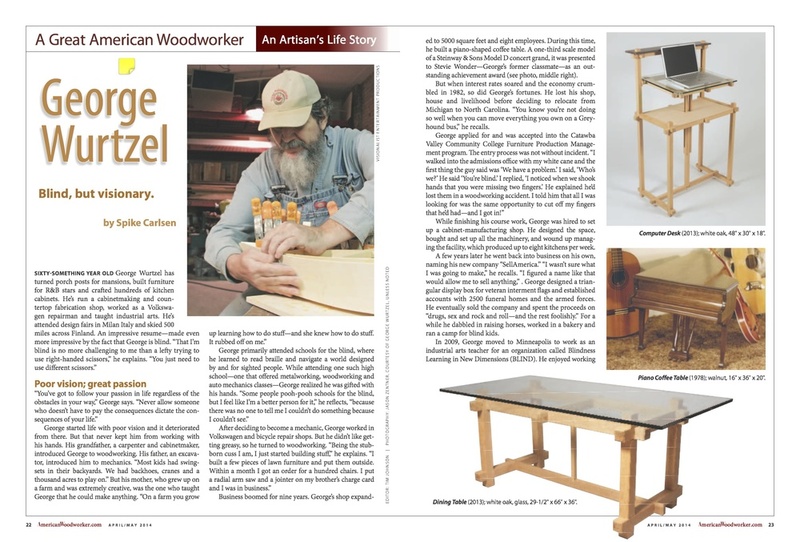 Above that is an article about George that was published in the April/May 2014 issue of American Woodworker. My exhibit was one of 17 in the 2014 People's Biennial at the Museum of Contemporary Art Detroit. Eric Soth and George Wurtzel - Illustration on the outside of my exhibit space. Eric Soth, was the person who collaborated with me to make this museum exhibit possible. MOCAD Teen Council and Youth Program Producer Tylonn Sawyer visiting my exhibit at the People's Biennial 2 in Detroit. MOCAD is on the corner of Garfield and Woodward in Detroit. 4454 Woodward to be exact. The People's Biennial will be open at MOCAD from September 12, 2014 to January 5, 2015. Special thanks to Jonathon Rajewski and Zeb Smith and the rest of the staff of MOCAD. They were very welcoming and helpful during the set-up. To Fred Wurtzel and Mike Ellis for recording and mixing a radio interview of me with music which plays in the piano. Keith Famie for his help with promotion and loaning Maire's sailboat for this exhibit. Visit the website www.Mairesjourney.com to see more on her remarkable courage. The Minneapolis Remodeler's remodeler's Showcase Home Tour features a home at 2316 Pillsbury Avenue S., Minneapolis that I made both interior and exterior pillars for. It is R59 in the list of homes. I built octagonal porch pillars for the exterior last year, to replace some that had been damaged by age and weather. The homeowners were so pleased that they asked me to build some custom support pillars to match other interior features of their home. Come visit this wonderful remodel Next Level has recently finished! The owners of this historic 1905 home have been carefully restoring and maintaining this home since they purchased it. With a growing family, they realized the need for a larger working kitchen, family room, and mud room, but still insisted on having the finished project be in keeping with the historic nature of the home. Extreme attention to detail was maintained during this project upholding major design elements of the existing home. Custom octagonal pillar I made of Red Birch to match the interior woodwork on this classic Minneapolis home. The fine detail on these support pillars I made matches the original trim in this classic Minneapolis home. Pillar as seen looking toward the living room. I'm so excited to be part of the People's Biennial at MOCAD. I've never had my work in an art museum before. I was contacted by Alec Soth several months ago and asked to put together an exhibit for this show in Detroit, Michigan. I'm looking forward to showing the world my craftsmanship. I'm making boxes that represent different experiences that I've had in my life. The boxes give people a glimpse at the things that have shaped me into the craftsman I am today. It opens on September 12 and runs through January 4, 2015. Tip box made of ash - tips go into the knot hole on top. People's Biennial is an exhibition series conceived by artist Harrell Fletcher and curator Jens Hoffmann in 2009. It examines the work of artists and other creative individuals, who operate outside the conventional art world. As such it recognizes a wide array of artistic expression present in many communities across the United States. In covering the little known, the overlooked, the marginalized, and the excluded, the project offers a view into a diverse range of creative practices in America today. The People’s Biennial also proposes an alternative to the standard contemporary art biennial, which mostly focuses on art from a few select cities (New York, Los Angeles, occasionally Chicago, Miami or San Francisco). It questions the often exclusionary and insular process of selecting art that has at times turned the spaces where art is exhibited into privileged havens seemingly detached from the realities of everyday life. 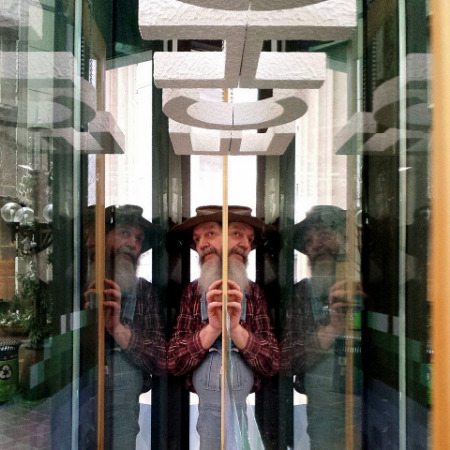 Harrell Fletcher has produced a variety of socially engaged, participatory projects since the early 1990s for institutions, museums and exhibitions around the world. He received his BFA from the San Francisco Art Institute and his MFA from the California College of the Arts. He studied organic farming at the University of California, Santa Cruz. He went on to work on a variety of small farms, which impacted his work as an artist. He participated in the 2004 Whitney Biennial and is the 2005 recipient of the Alpert Award in Visual Arts. In 2002 Fletcher created Learning To Love You More with Miranda July, a participatory website now in the collection of the San Francisco Museum of Modern Art. Fletcher is an Associate Professor of Art and Social Practice at Portland State University. Jens Hoffmann is the Deputy Director and Head of Exhibitions and Public Programs of The Jewish Museum, New York and Guest Curator at the Museum of Contemporary Art Detroit. He has curated more than 50 exhibitions internationally since the late 1990s, including the 2nd San Juan Triennial (2009), the 12th Istanbul Biennial (2011) and the 9th Shanghai Biennale (2012). He was the Director of the CCA Wattis Institute for Contemporary Arts in San Francisco (2007–12) and Director of Exhibitions at the Institute of Contemporary Arts in London (2003–7). Maire's Journey. A long journey to the sea began on Saturday. I was asked by Maire Kent to build a boat to take her ashes to the sea. She died a few weeks after we met, before the boat was finished. Keith Famie filmed me building the boat at my shop in Minneapolis. Emmy Award winning producer, Keith Famie and his friend John Feist (The original producer of Surviver) filmed the ceremony in Cross Village, Michigan. A happy film crew after the boat lunch for Maire's Journey to the sea. Cross Village was the departure point, her boat will travel through the GREAT LAKES to the ATLANTIC OCEAN. Family and friends attended a ceremony to launch the boat I built to carry her ashes to the sea. A large crew orchestrated by Keith Famie and John Feist filmed the ceremony in Cross Village, Michigan on Saturday, July 12,2014. The June 22, 2014 issue of the Minneapolis Star Tribune carried a feature on me and my shop here on Stevens Avenue south. I was on the front page of the Variety Section as well as most of page 7. When you visit their web page and search for "George Wurtzel" you get the article, a slide show of photos, and a really nice video. I was so happy to meet Kristen Tillotston and her photographer Elizabeth Flores from the Minneapolis Star Tribune. 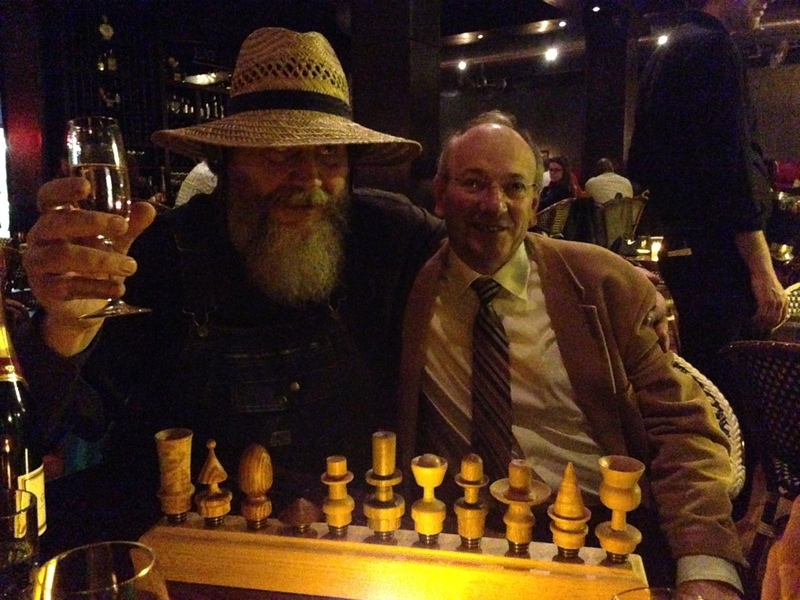 We spent part of two days talking about woodworking, my shop, my life and my philosophy of life. Their videographer, ,and I both discovered that we (as well as very many people) are extremely allergic to dust from Mullberry Trees. WARNING- Don't cut up or turn Mullberry wood especially inside. The dust caused me to have serious flu-like symptoms for several days. I just finished building a rustic walnut slab table from a tree on Quincy Street in Minneapolis. My friends needed to have a tree taken down that had grown too large and too close to the foundations of their house and garage. The walnut tree was very large and rather than have it cut and hauled off to the landfill we had it harvested and cut into slabs and lumber and kiln dried. This rustic table top has natural "live edges" with some chain saw marks on the ends. The table base has bark on the book matched upright supports. The table is 17" tall by 43" wide and 22" deep. It's finished with Tung oil to enhance the natural wood grain. The tree on Quincy Street will live on in as I continue to build furniture and small pieces from it. This is the first table I've made from it. I have used smaller pieces to make boxes and small useful items. The smallest pieces are now bottle stoppers. 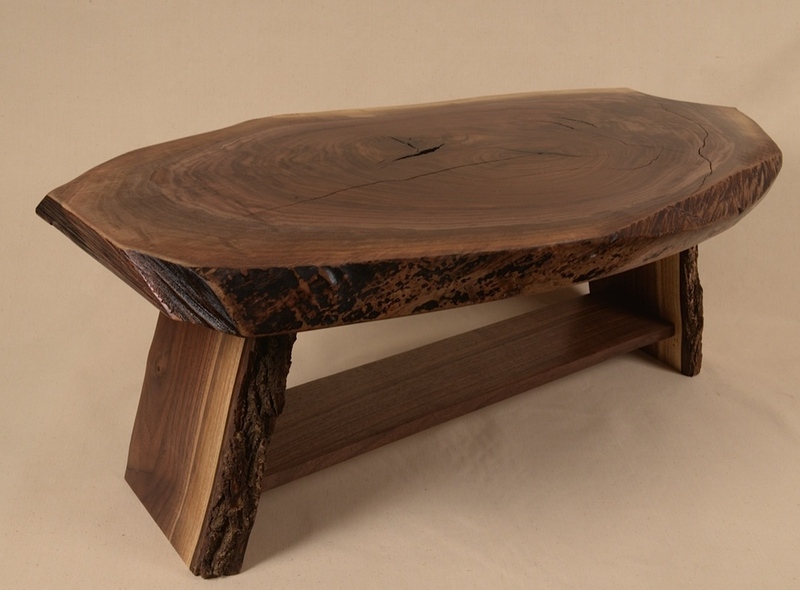 Rustic Walnut table built by George Wurtzel. Photo by Sean Smuda. Natural live edge on rustic table top and bark edge on table base. Table by George Wurtzel, photo Sean Smuda. Walnut slab finished with tung oil. This 2" thick slab is the one used for the table top. Very small pieces from the Quincy Street tree become bottle stoppers. This is my first in the shape of a top hat. OK!!! I made my first international sale and like many great things, it happened in a bar. The place where many amazing things start. I was at Eat Street Social and the owner, Sam Bonin, asked me if I had any of my wood stuff with me, which I almost always do. Well, as fate would have, it I had none. So he tells me that there is a man from France there, Marcel Combes, with his wine distributor, who owns the winery where Sam gets his sparkling wine from and he wants me to meet him. So, I just happened to have my personal French interpreter there, Sean Smuda. Sean went over to the table to talk French to the gentleman. I grabbed my coat and ran back to shop and grabbed all the bottle stoppers I could find and a couple of other pretties. I got back to Eat street just in time to taste some amazingly good sparkling wine and presented my bottle stopper display to Marcel. He was so impressed that he bought all I had and has decided to sell them in his winery store in Bourgoin, France. I am Looking forward to future orders from him. And mom said nothing good would ever come from hanging out in bars. Check out the April/May edition of American Woodworker Magazine. They did a four page article on me. Pages 20 - 21-22-23. This weekend I built 2 red oak bookcases with fixed tops and bottoms and two adjustable shelves. They are open style, very sturdy, but light enough to move easily. Solid red oak lumber components. The sides and backs look like pickets in a fence with beveled angled tops. The four legs are on the side corners with one narrower slat centered between them and 2 narrower slats on the back to keep the books in. The legs are oak slats 7/8" thick by 2 1/2" wide. They are similar to those built in the Arts n Crafts era about 1920, and they look like contemporary styling too. We had some very similar to these in every dorm room at MSB. dimensions - 42' tall by 19 1/4" wide by 12 1/2" deep with two adjustable shelves. I built a sailboat to carry Maire Kent's ashes to the sea. Here is a photo of Keith Famie and me in my backyard in Minneapolis. The boat is finished and will launch in June 2014. I want to share this Utube video on a project I've been involved with. I met Maire Kent at a dinner back in Michigan. She had been fighting cardiac sarcoma, a very rare cancer, for almost a year. When it seemed obvious that all the treatments known to man could not cure her, she decided to live the best life she could until her time on this earth was over. Maire asked me to build a sailboat that could take her ashes to the ocean. She also wanted to do something for others who will someday have this cancer. Maire's doctor, at the University of Michigan Hospital, started a campaign to raise 1 million dollars for research of this rare disease. Keith Famie posted this on his Facebook page "Maire Caitlin Kent died at the age of 24 of cardiac sarcoma, a rare form of cancer that occurs in the heart. She battled with for nearly one year and on September 27th 2013 the cancer claimed her life. It was her wish to have her ashes journey out to sea in order to travel the world. A book that she and her siblings read growing up, “Paddle to the Sea” inspired this idea that she had. This is a story about a little boy who carved a wooden canoe with an Indian in it so that it could travel the Great Lakes and make it all the way to the sea. Maire loved this story and thought that this would be a great ending for her journey. With the help of a blind woodworker named George Wurtzel, who’s based in Minneapolis, Minnesota, Maire’s wish is on its way to becoming a reality. After meeting with Maire just a few weeks before she died, George was able to give her a brief glimpse of what her boat would look like. 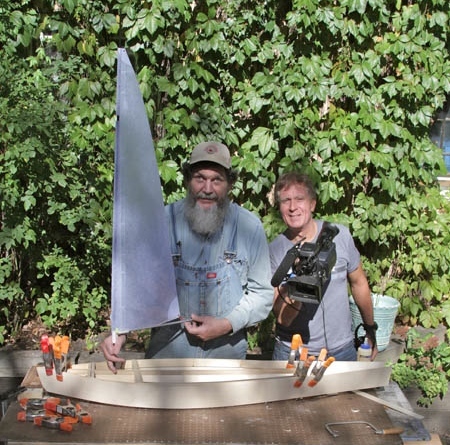 In the weeks after her death, George has tirelessly worked to complete this boat for Maire. Here is a look at the progress. My selection of bottle stoppers is forever changing and it is unlikely that I will make two the same. Each stopper becomes whatever is in my head when I turn it on the lathe. Most are made from my special box labeled "wood too small to save". They fit a wide range of bottles and are great for wine, oil, beer, vinegar or any other product that needs a quick and easy pretty top. For some of us with arthritic fingers these make it easy to uncork and re-cork bottles. To purchase or to visit George's storefront, contact him at 517-449-2150 or gmwurtzel@gmail.com. Assorted decorative wood bottle stoppers. Photo by Karen Kopacz. 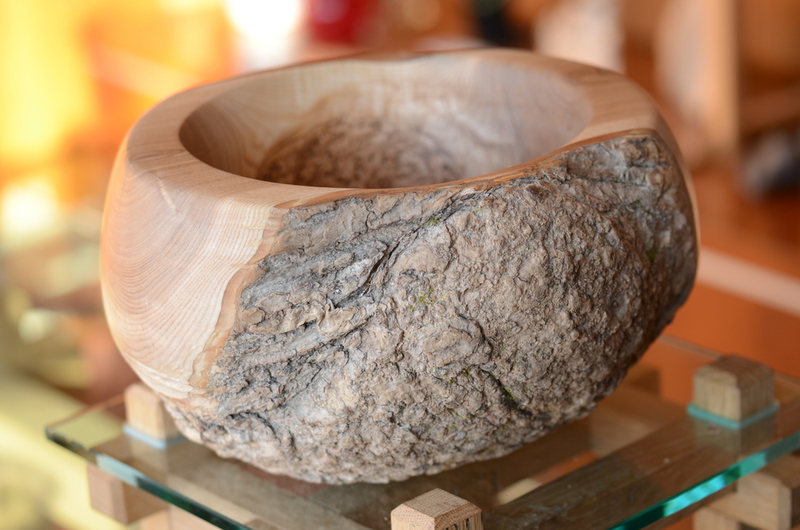 This black ash bowl is made from burl. The exterior has bark still on except the ends where it was cut from tree. Interior of this bowl is stunning with grain and coulers going in every direction. Size of the bowl is 12 inches across and about 6 1/2 inches deep. Black ash bowl. Photo by Karen Kopacz. Like many of my little things, Christmas ornaments just imagine themselves in my head kind of like sugar plums dancing around. I cannot make them fast enough to keep up with my friends who want one of my special creations hanging on their tree for years. The ornament featured on the left is made from a prism, salvaged from old chandelier. 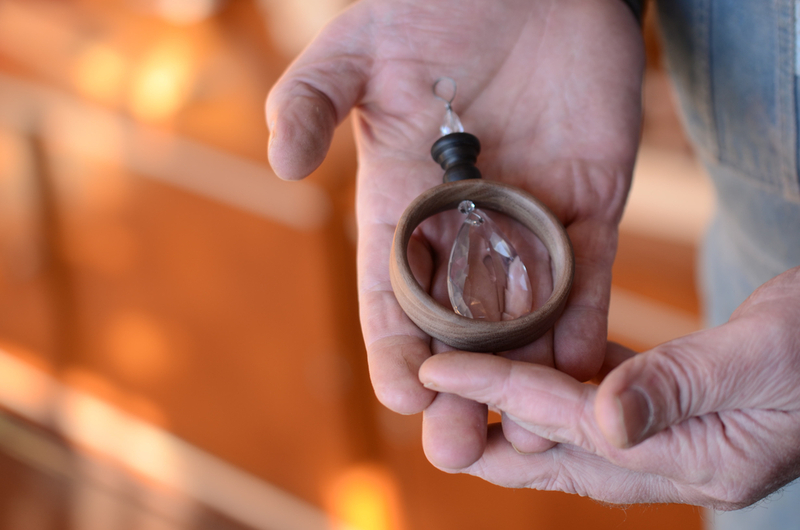 It is suspended inside of a walnut ring with a small black wood button and another glass crystal above that. The ornament featured on the right is a special ornament for my friend Dawn. It is made from 3 pieces of turned wood. The top and bottom are blood wood and the center orb is birds-eye maple, her favorite wood. Watch for more ornaments to appear in this Newest Work section. You willl need to be quick to get one. Ornament with prism, salvaged from an old chandelier. Photo by Karen Kopacz. Blood wood and birds-eye maple ornament. Photo by Karen Kopacz. I sometimes find logs that have the bark firmly attached and look like they would make interesting pieces. Here is a red birch bowl, about 9 by 6 inches by 3 inches deep. This is a good bowl for keys, phones and other little treasures that you want to keep from wondering around the house. This bowl was made from a split log and the ends were hand cut to expose a lot of the grains. The finish is clear tongue oil. Red birch bowl. Photo by Karen Kopacz. Sometimes I see something and say to myself I could make something cool out of this. Here is a glass globe lamp that uses an old 9 inch spiraled glass globe. I do not know how old the globe is, but I bought it at yard sale and have had it around for 20 years. The base is a piece of stunning curly maple that has very distinct graining. The chatoyance (a striking three-dimensional appearance) of this wood is excellent. This lamp is 12 inches across and about 11 inches tall has a 25 watt incandescent bulb. There is no venting so if you want it to be brighter an LED bulb can be used. Globe lamp. Photo by Karen Kopacz.